What I like: Solid basics, how traffic is handled (for the most part), large areas to build, no online requirement!. Not So Much: Some aspects of simulation too simple, bland buildings from a gameplay perspective. Other Stuff You May Like: Modding support. The Verdict: A promising city builder with some holes. Creative types will probably get more value from it. Players are attracted to city builders for different reasons. Creative types enjoy making their cities look pleasing to the eye - a curved road here, a nice copse of trees over there. Less creative types - like me, are building with a purpose. There needs to be challenges of some sort, otherwise we think, 'What's the point?' Of course some people straddle these two groups with their weight shifted more or less to one side, and which group you favor can radically affect how satisfied you are with a game. Disclaimer - while I enjoy playing city builders, I do tend to tire of them quickly. They tend not to offer up new challenges to keep me interested long term. 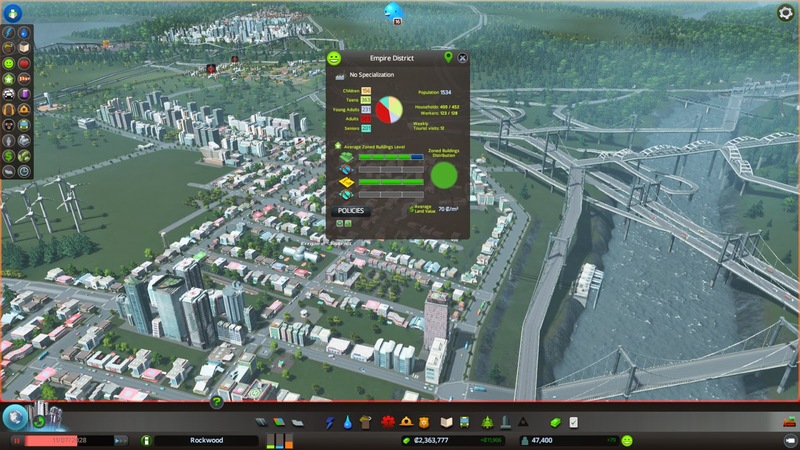 Cities: Skylines is a city builder along the lines of SimCity, not the resource management games like the Anno series. Roads are laid down, zones defined (residential, industrial, and commercial) and services are provided. 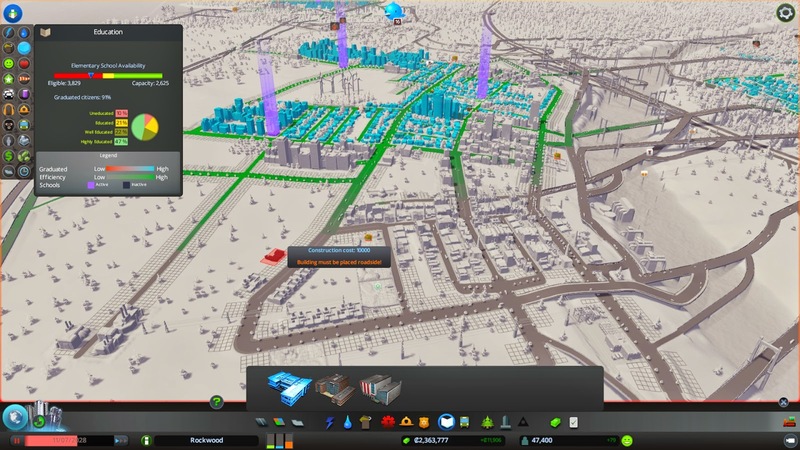 Fortunately the Cities: Skylines release was much smoother than the newest SimCity - most definitely due to the lack of a forced online requirement (other than just connecting to Steam). There must have been a pent up demand for such a game, because Skylines broke the Paradox Interactive sales record for a game hot off the press. 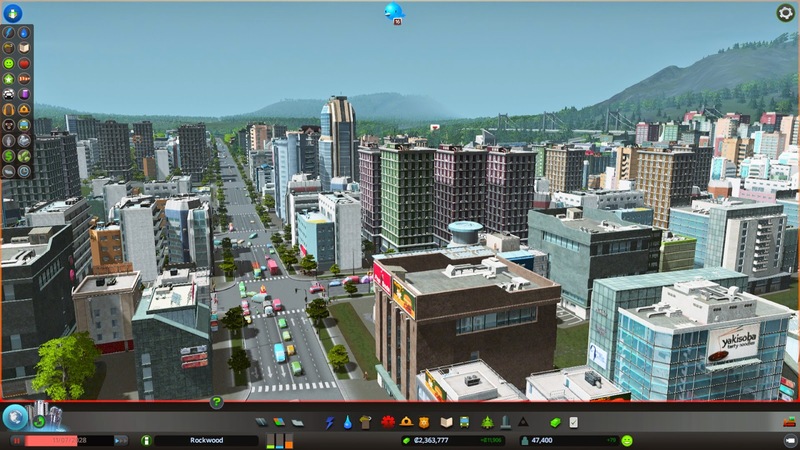 For the most part, Skylines provides an easy to use set of tools to build your city. Laying down roads is a simple process of selecting the type of road you desire and with a couple clicks - bam, you're done. Gravel roads, various sizes of paved city streets and highways all exist. Use 1-way roads to try and handle troublesome areas. Some roads are decorated with trees to increase land value. The game automatically displays the area that can be zoned so you can immediately see if you're using the available space wisely. Unfortunately you don't get to see the guidelines until after you click, so at times there is some clicking and canceling going on until you hit the spot you want. I can't remember another city builder that makes it easier to create elevated roads with entrance and exit ramps. The handy shaded area is the land that can be zoned- along with the gray grids already present. Running utilities is an area that could be more streamlined. In theory I enjoy control, but running water pipelines is just busywork. There isn't any real challenge to it or strategy necessary. On the other hand, power lines are a bit annoying. Buildings in close proximity automatically pass power access to their neighbors - which is good. Unfortunately when buildings pop up in freshly zoned areas they may not have access to power - so you wait and hope some more buildings pop up close enough to power access or you need to run power lines within your zone to reach the new buildings. Doing so de-zones those tiles, so it won't develop on its own until you manually destroy the power lines and rezone the area. Neither of these are a huge deal, but it could be better. Building placement on the other hand is a breeze. Once the new building is hovered over a valid location, its effective area is highlighted along the roads. Since Skylines is developed by Colossal Order, developer of more transportation-oriented games, it's no surprise that it's easy to draw mass transit routes. As long as you don't need to edit them life is good, but I could never figure out how to effectively tweak and existing line. It was always easier to delete it and start fresh. The newly shaded green area will now be able to get an education! There are some other niggles as well. I've always liked putting parks in the center of some residential buildings. It's always nice to walk to a park when the weather is nice. Since parks need road access in Skylines, I can't lay them out how I like to. - the ability to show the color coded zone grid, even when I'm not actually zoning. - am I going to run out of capacity soon? - where are there traffic issues? The basics seem to be well covered, but sometimes you want to dig a little deeper. - Why isn't that household at maximum happiness? - Which residential buildings have available space? - How many people died from getting sick? - What percentage of people are overeducated for their jobs, or jobs available at various education levels, the education level of those unemployed? Sometimes you can get this data for individual buildings by selecting them, but having more sophisticated data overlays to look at areas from above would be helpful. Traffic modeling is both the high point and source of some of my bigger gripes. Traffic occurs at logical locations and watching the routes cars take can be very informative. 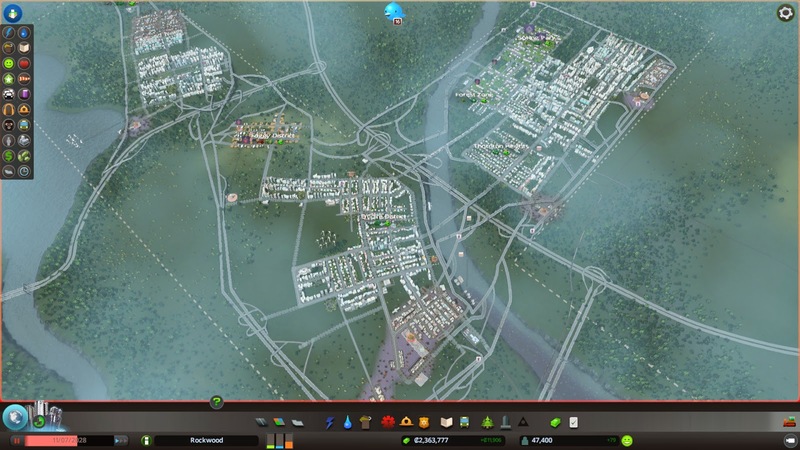 In fact, my favorite aspect to the game is creating additional roadways and watching to see how the traffic patterns adapt. In the majority of cases it makes a lot of sense to me. 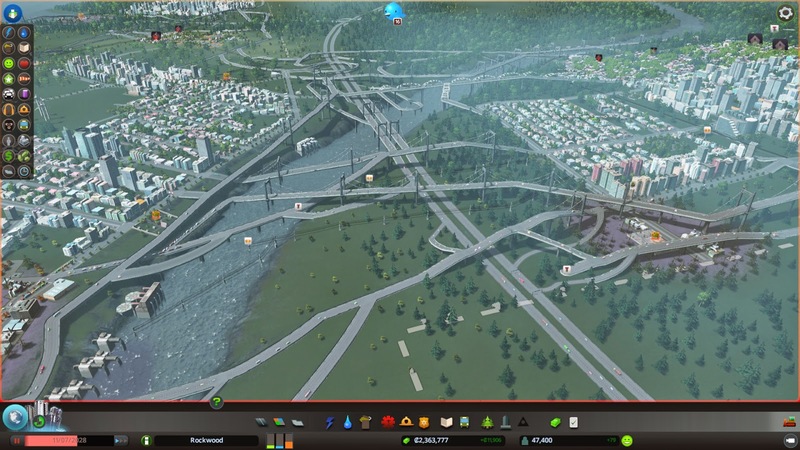 I enjoy adding some really crazy highway layouts and watching to see who chooses to use it. I can get mesmerized by the little vehicles, selecting one now and then to see where it's going. There are times where the illusion of having tiny people travel through my city is dispelled. Sometimes a line of cars will crowd into one lane when others are available. In some cases you can feel the consequences of having traffic issues, dead bodies start to pile up at houses, and sanitation workers can't collect the trash in a timely manner. Good stuff. Unfortunately there aren't any consequences when workers can't reach their places of employment. If stuck in traffic for too long, they will magically teleport back to their house. Their workplace will continue on as normal, even if none of their workers can reach them due to traffic. The citizens will happily move on to other tasks, never getting upset that they couldn't reach their destination. This issue is being discussed on the forums, so hopefully this area of the simulation can be strengthened. Industrial and commercial buildings do require a supply of goods, which is more completely modeled. So there is some good and bad aspects to the game's logistics. I created some crazy highways, well, because I could. Providing services to your people is one of the important aspects of most city builders and I briefly mentioned it above. Fire engines travel from station to house to put out fires, cemeteries send out hearses to pick up the dead, and more. Everything I expect to be included is. My one complaint is that there really aren't any interesting choices to make. In the latest SimCity buildings had cool additions you could add to it. In Skylines there really isn't much to them. Just plop down the building of which you want to improve coverage. 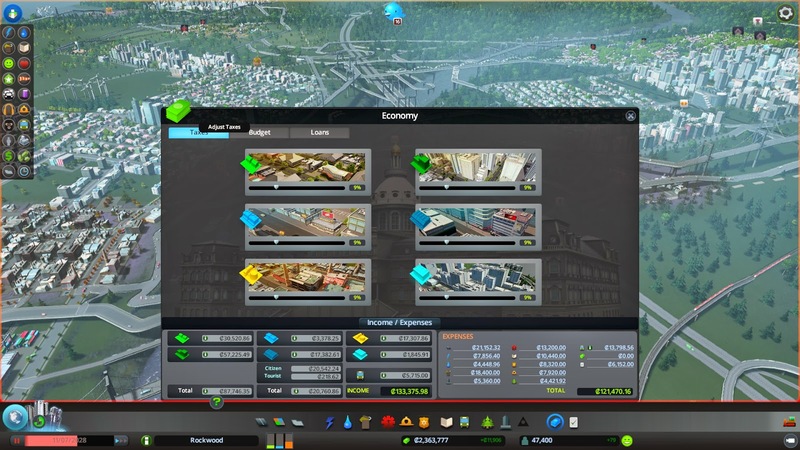 As expected, wanna be mayors can tinker with tax rates, tweak budgets, and take out loads when low on cash. Pretty much what one might expect in a game like this. Other than taking out a couple loans, increasing the education budget, and decreasing some taxes, I didn't really need to visit this area often. Colossal Order (CO) included the ability to add districts to your city, which can be combined with city policies to give areas their own flavor. Don't want your city center to burn down? Create a district and give them free smoke detectors. Ban high rise buildings in certain locations. There are a couple dozen to choose from. In practice I didn't really use districts except to take advantage of the resources on the map - creating timber industry and ore mining. There are 4 special resources in all to take advantage of, each with slightly different characteristics. I think with some more interesting effects districts could be an interesting addition. Another feature that is interesting on paper is that CO modeled the flow of water. Pumping wastewater into the river causes the pollution to travel downstream. Sean Sands at Gamers with Jobs wrote about an interesting effect of this feature. It should also be noted that as your city grows, new land areas can be purchased, unlocking new areas for your city to expand. The available area is so much larger than the latest SimCity. This will be a big plus for many people. ... which gives quite a large area to build. Many mods already exist on the Steam Workshop so you may want to see what's available. There is even one to disable the chatty bird Chirpy that likes to sputter annoyingly frequent messages about nothing of real importance. Skylines is an attractive game and also performs nicely. Buildings are detailed and tree lined streets seem like a fine place to take a walk. The only downside I can think of is that art assets are repeated pretty frequently. It doesn't bother me too much personally, but if you like a lot of variety you may be at least a little disappointed. Mods may help the game out in this regard. If you've made it this far, you can see that while Skylines is promising, I'm not totally enamored with it. I feel bad for saying this because the people at Paradox Interactive seem like a cool group of people. I'm pleased it has done so well for them in such a short period of time. I hope it leads to further improvements! CO seems interested in gathering feedback on the forums. 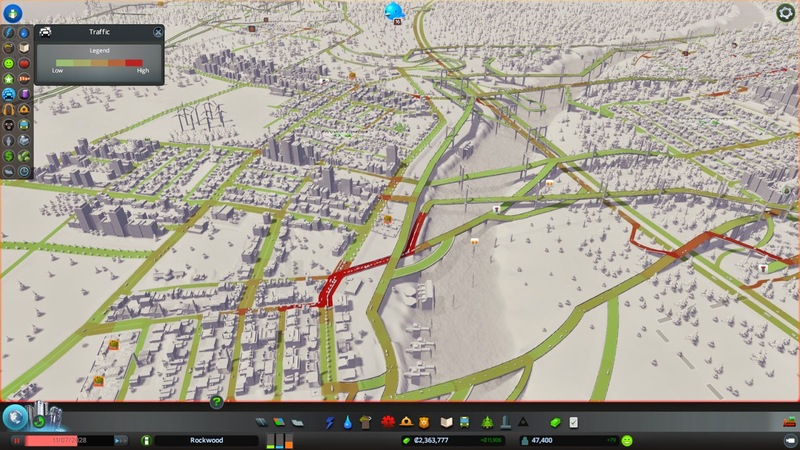 Skylines does many things right - ease of road construction, traffic modeling, and the city builder basics. By far the aspect I enjoyed most was building roads and watching the traffic. I don't get into the creative aspect of city building, so my contentment comes from overcoming challenges provided by a detailed simulation. 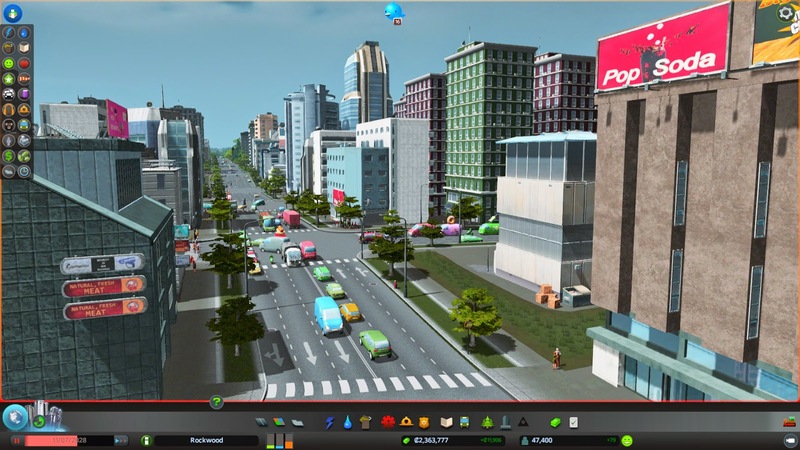 I need to feel like traffic problems matter more than they do in Skylines. People should be mad when traffic prevents them from arriving at their destination. Businesses should shut down if their workers never arrive. I didn't really have money issues, which maybe would be solved by using the hard mode mod. It is a pretty beginner-friendly game, so don't expect a great challenge out of the box. I think creative types would get more out of the game then I do, and beginners to the genre are given a warm fuzzy hug. My negative comments aside, I do think it is the best of the 'traditional' city builder type of games - the new SimCity and Cities XL. 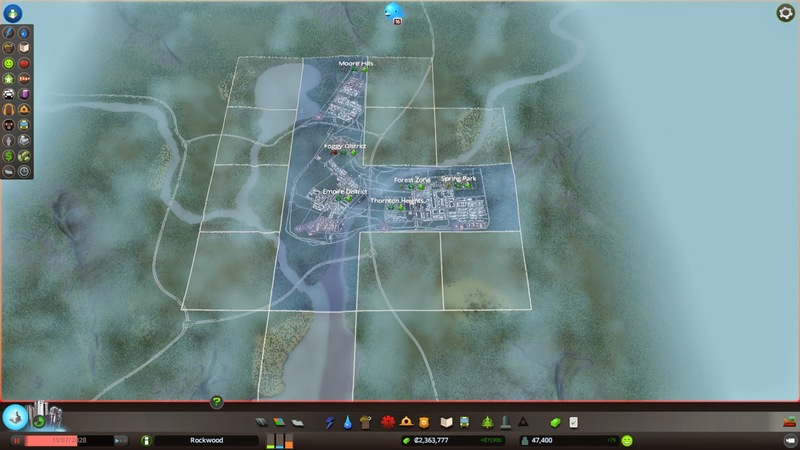 It's also kept my interest longer than Banished due to the interesting road building in Skylines. 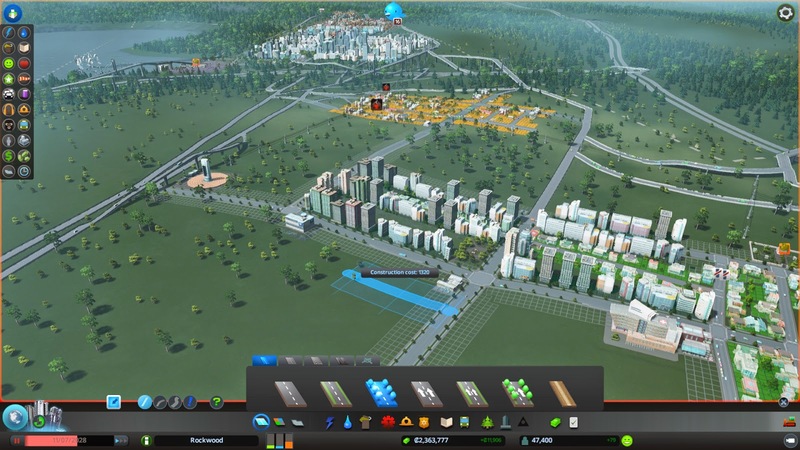 By their nature, city builders can get repetitive and I don't have a high tolerance for that. I hope the game gets a lot of post release support, and Paradox has a great track record when it comes to that. Maybe after some updates my opinion will be a little more positive. Edit 3/17/2015: Karoliina at Colossal Order said that they are working on a solution to the 'workers not reaching jobs have no consequences' issue. She isn't promising anything, but that it is an important issue to them.